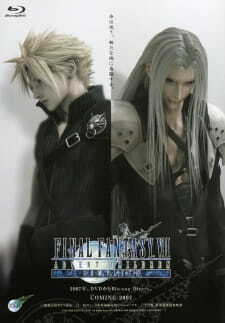 Final Fantasy VII: Advent Children Complete is a revised version of the original Final Fantasy VII: Advent Children with added scenes. If you are a total Final Fantasy fan you will have already watched this. If you are and you haven't you must watch it! The film contains a considerable amount of new footage that the original version lacks, as well as roughly a thousand revised scenes. This adds a total of 26 minutes to the film. Some of the new scenes include a more in-depth look at the Geostigma, Denzel and Kadaj's origins, as well as an extended fight between Cloud and Sephiroth. Back on to the main topic, the story is pretty complex to explain in great detail in this review, but let's just summarize it. Basically, it focuses on the main character, Cloud, and how he teams up with friends to stop an illness called 'Geo-stigma' whilst searching for the truth and uncovering the past. This is by no means a easy story to read, but if you know a lot about Final Fantasy then you should understand the film. The art was simply stunning and amazing. Actual 3D renderings were made to this film. By no means am i comparing this film to your average anime because this is totally on a different level. If you watch this film in HD, it is just simple awesome. The characters looked so detailed and the different environments are just beautiful. You can compare the film's art to the cutscenes in the latest Final Fantasy games on the PS3. Sound was also superb. Even though I watched this in English, it was appropriately voiced to spec. No complains here. The presentation was wonderful. The theme songs were also appropriate and there were plenty of explosions to be heard. Let me talk about the characters. Firstly, you will not understand who they are or what they do if you do not know anything about Final Fantasy. Let me say this, all is not what they seem. Friends can turn into enemies and enemies can become friends. the characters all have complex relationships with one another. Play the game to get to fully understand the background for each and every one of them. Overall, it was enjoyable to watch the awesome graphics and battle scenes play out. The story takes a while to comprehend and the characters are a bit confusing but heck, its Final Fantasy, who gets it anyway? Really well animated film in the end. A bit hard to comprehend what is happening if you are not into Final Fantasy. Well voiced characters, theme songs and lots of sound effects. Pleasing to the ear. Too many characters with too few explanations. Play the game to find out more. Loved it. I was always a fan of Final Fantasy and this was one well presented film. The stunning visuals just blows you away. The sound quality was great and the characters were really detailed. Just the story needed a bit more explanation.